How can I get market reports on consumer goods? Covers 350 markets in 207 countries with quantitative data on consumer lifestyles, retailing, countries, consumer markets and in-depth market analysis reports. Provides updated market data, statistics and analysis on the Internet, e-business, online marketing, media, and emerging technologies. 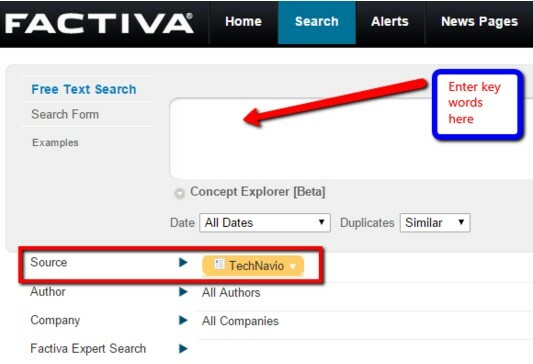 Locate TechNavio by Source to retrieve these full-text reports on a wide range of industries and geographies. Reports cover topics including IT, energy, engineering, consumer products, automotive, telecommunications and more. Enter "market share" and the consumer goods of interest into the search box or click on the Markets link, then the Categories link to navigate to the Consumer Goods and FMCG (Fast Moving Consumer Goods) portion of the database.